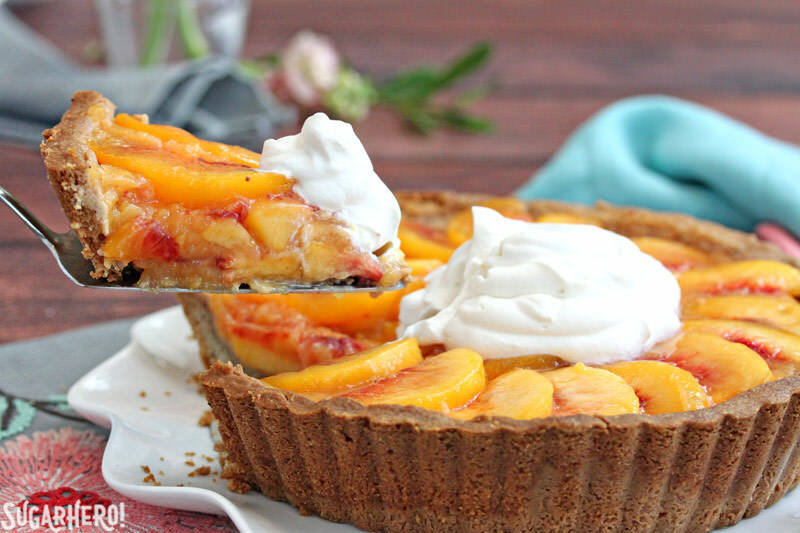 If you love fresh, ripe peaches, then this Fresh Peach Tart is for you! The peaches aren’t cooked in the oven, so they keep their wonderful, just-picked tasted and texture. 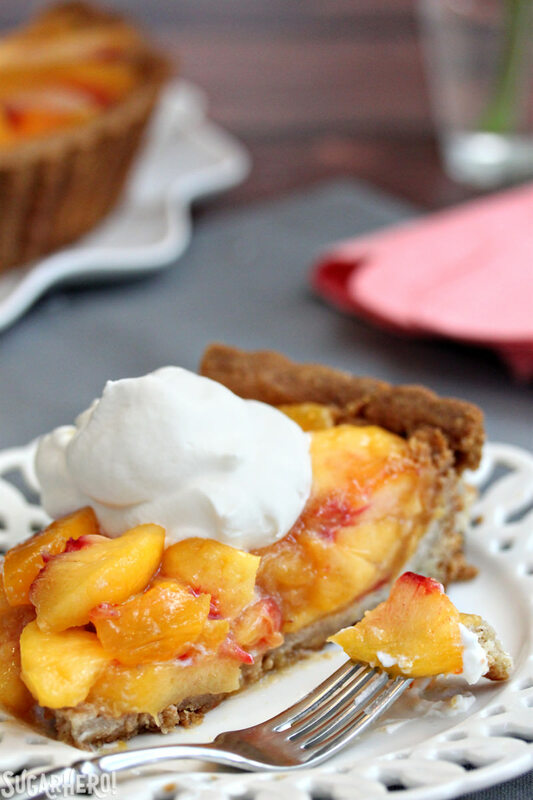 Juicy peaches + buttery tart dough = peach perfection! Please understand: I don’t can. I’ve never made freezer jam in my life. I have no need for more than 5-6 peaches in my house at any given time. And yet, I am currently the proud owner of 22 lbs of fresh Utah peaches. For a household of 4 people. SEND HELP. Please tell me I’m not alone, that I’m not the only person who gets seduced by the sight and smell of a mountain of just-picked peaches. I see them and I imagine all the clever and crafty things I will make with them. Part of me knows there’s a .01% chance that I’ll actually learn to can this year, but another, more delusional part of me pictures myself lining up rows of freshly canned peach halves and things, “Yes, that is completely accurate and likely to happen.” The self-deceit is strong here, people. So instead, what we do is eat them raw until we are completely sick of peaches. I stick them into every baked good imaginable. I give them away to neighbors because I am not above buying people’s affections. And then, when the last of them are rattling around in the box looking a little shriveled and worse for the wear, I slice and freeze them for future smoothies. The system, if you could even call it that, works pretty well, all things considered. 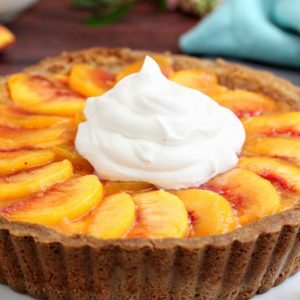 This Fresh Peach Tart is just one of the many ways I’ve found to use up a surplus of peaches, but that’s not the only reason I love it. 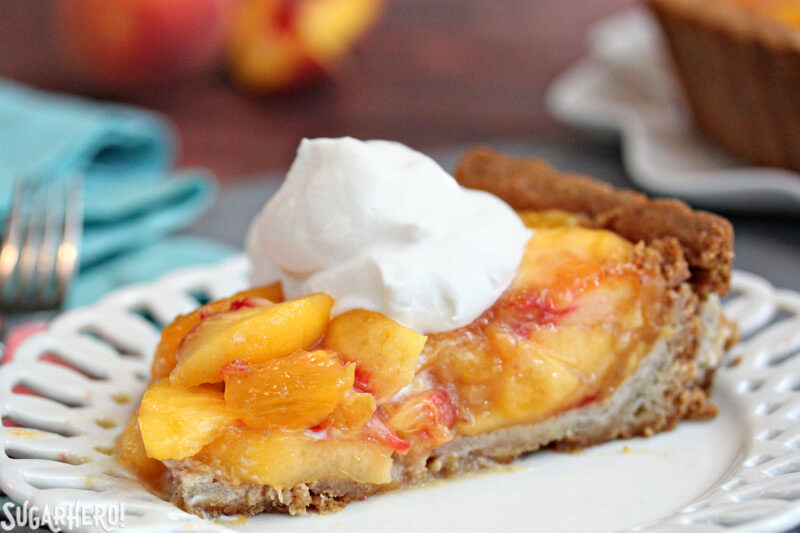 It really showcases peaches at their best, preserving their taste and texture better than a cooked peach pie can do. It starts with buttery tart dough, made with toasted and ground pecans to give it a nutty flavor and short, crunchy texture. 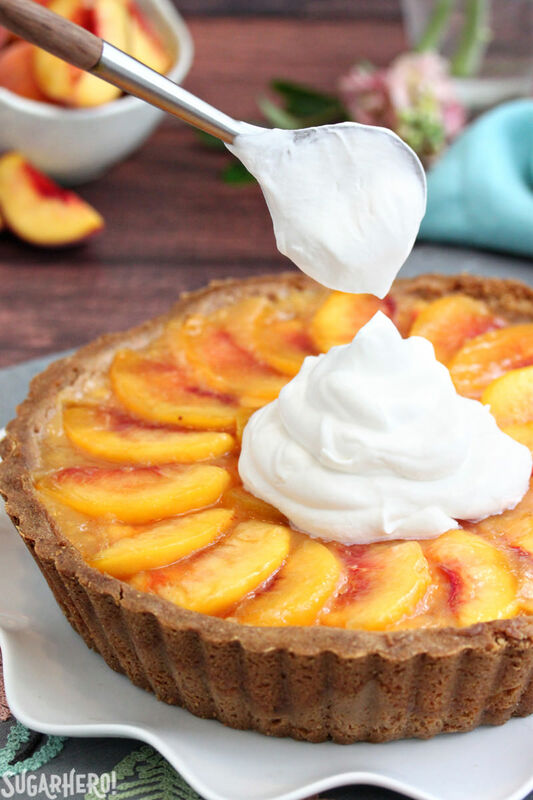 The dough is good enough to eat raw (…not that I would know…) but instead, it’s pressed into a deep-dish fluted tart pan and baked until golden brown, with an egg white wash brushed on the bottom to keep it from getting too soggy when it’s filled with peaches. 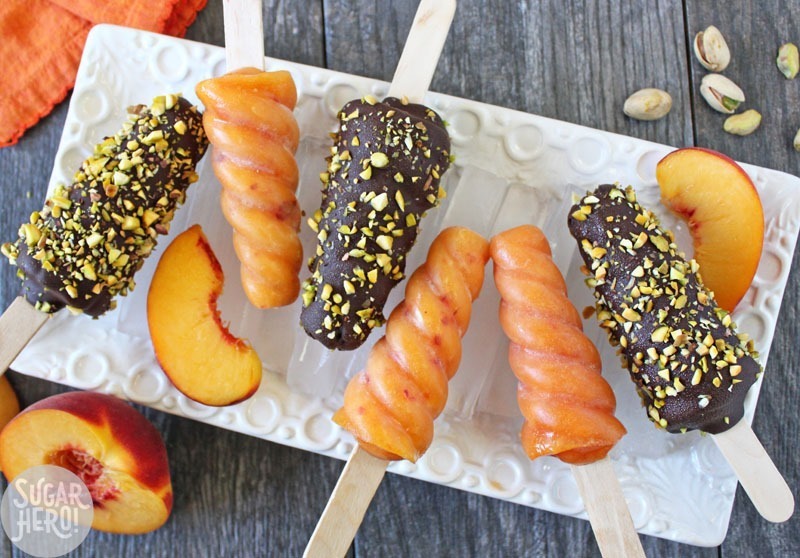 The filling is peach OVERLOAD! It’s a mix of peach puree, sugar, cornstarch, lemon juice, and fresh peach chunks. It’s cooked on the stovetop until gelled, then spooned into the crust to set in the fridge. I added a sliced fresh peach fanning out over the top, because I’m precious like that, but honestly, the mounds of fresh peach chunks looked pretty good on their own. I have a good friend who hates cooked fruit pies, and I never understood that until I tried this Fresh Peach Tart. 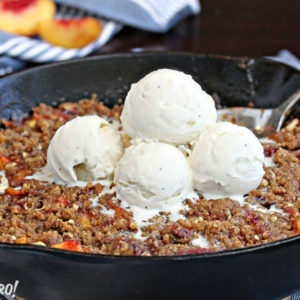 Now, I still like peach pies, but there’s something more pure and undeniably peach-y about this no-bake stovetop version. I’m not going to stop making peach pies, but I’m definitely going to rotate this recipe in more often, because it really captures the essence of fresh peaches, and that’s something to celebrate. 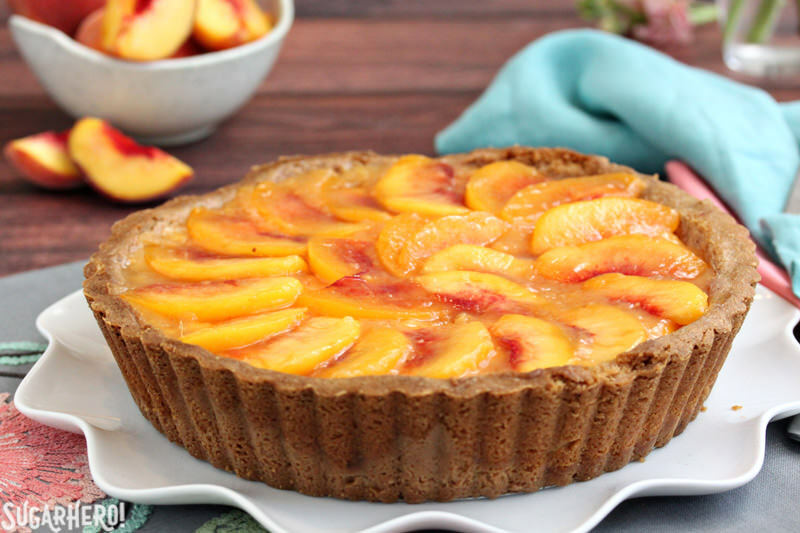 If you love fresh, ripe peaches, then this Fresh Peach Tart is for you! The peaches aren't cooked in the oven, so they keep their wonderful, just-picked tasted and texture. 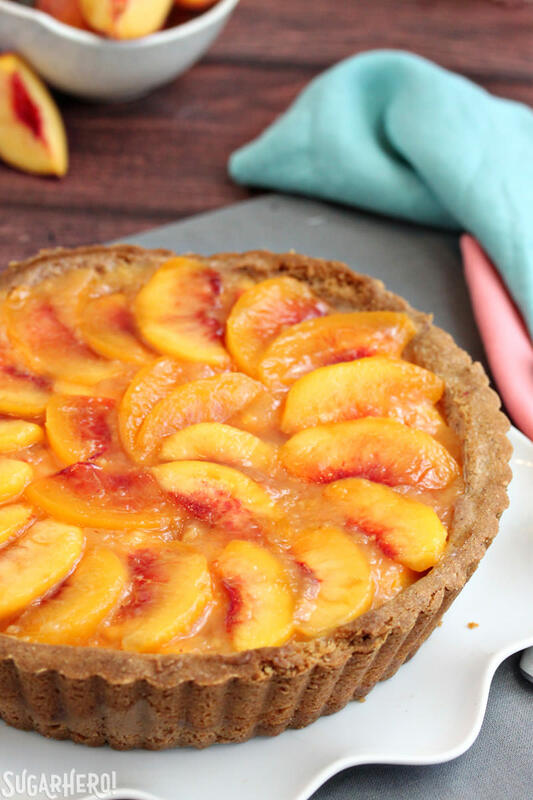 Juicy peaches + buttery tart dough = peach perfection! The tart dough contains ground pecans, but if you don’t have them, you can substitute other ground nuts, or just an equal amount of flour. If you’re pressed for time, you can use a fully-baked deep dish pie shell instead. Place the sugar, flour, ground pecans, and salt in the bowl of a food processor, and pulse briefly until everything is well-blended. Add the cold cubed butter and pulse until it is in small pea-sized pieces. Separate the egg, and add the egg yolk to the bowl of the food processor, pulsing in long 5-second bursts until the dough starts clumping together. Turn the dough out of the food processor and knead it lightly several times to incorporate any extra flour. At this point, the dough can be wrapped and refrigerated for several days. 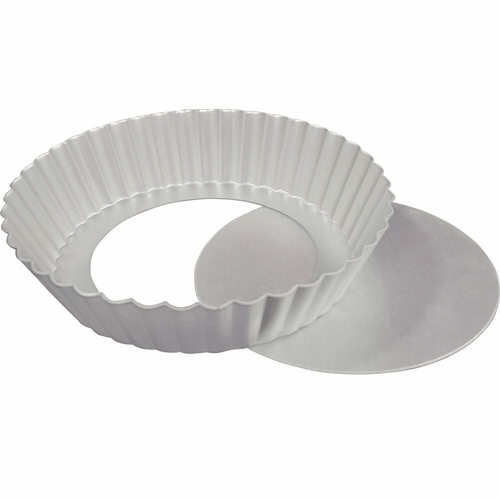 If you’re ready to use it now, spray a deep-dish 9-inch tart shell with a removable bottom with nonstick cooking spray. Press the dough in an even layer into the bottom and sides of the pan. Freeze the shell for 30 minutes, and while it’s in the freezer, preheat the oven to 375 degrees F. Spray the top of the tart dough with nonstick spray, then press a sheet of foil onto the shell, shiny side down, and fill the foil with dry beans, rice, or pie weights. Bake the tart shell for 20-25 minutes, until the sides start to take on a little color and the center no longer looks raw, then carefully remove the foil and weights. Brush the bottom and sides of the shell with the beaten egg white. Bake for an additional 10-12 minutes, until the shell is golden brown. You might want to cover the sides with foil to prevent them from getting too dark. Let the shell cool completely before filling it. Peel the peaches and slice them into thin slices. Take about 2 cups of peach chunks (approximately 20 oz, from about 4 peaches) and place them in the food processor, then process them until pureed. Combine the peach puree, sugar, starch, and water in a medium saucepan, and whisk until smooth. Place the pan over medium heat and cook it, whisking often, until it is bubbling, noticeably thick, and has become translucent. This will probably take 8-10 minutes. Whisk often so it does not scorch on the bottom. It is very important that you cook it long enough on the stove for the starch to thicken the filling, otherwise the filling will not set. Once thick and translucent, remove the pan from the heat and stir in most of the remaining peach slices—reserve about 2 dozen very thin slices for decorating the top. Place the pan with the warm filling in the refrigerator for about 10 minutes—you want it to cool down to room temperature, but not set completely. Once it is no longer hot, pour the filling into the baked and cooled tart shell, and spread it into an even layer. Top the tart with the reserved peach slices, fanning them out over the top. Refrigerate the tart to set it completely, for at least 3 hours. Once set, cut it into slices and serve with a big pile of whipped cream on top! This tart is best enjoyed within a day of making it. It can be eaten for several days after that, but the tart shell will eventually get soggy and the texture will suffer. This looks amazing. Just printed the recipe. I do know how to can but I like your method. I have done peach jam. It’s very good. But I now only can my mother’s recipe for ice water pickles. I have given them to friends that just eat the whole thing in one sitting. Maybe this will be the year I get my pictures together and post it on my blog.